Peninsula You assess dentures thoroughly to guarantee its reliability. Our team of experts makes necessary repairs to help restore its appearance, function and fit. We are skilled in performing relines or refitting of the denture to the gum tissues to make it a perfect fit. The process of relining involve obtaining an impression of the gums and mouth, taking away some of the acrylic part from the tissue portion and followed by adding new denture material. We are fully aware that these conditions affect how the dentures fit. Our team encourages you to come to our dental laboratory when you feel that your denture is getting loose and falling out of place as you speak or eat. When loads of dental adhesive seem not enough to hold the denture in place and you notice that it is getting chipped, we are here to help you straighten up the problem. Standard – In this, the material is the hard acrylic used denture. Soft – This technique make use of softer lining in the denture that enhance its comfort especially in instances where the traditional hard acrylic can cause soreness. We reserve this kind of relining for older patients or those with overlying gums on the ridges and thin mucosa as well as post surgery patients and those with mental nerves exposed. Aside from relines, our laboratory is also well equipped in performing repairs. We have the best people and tools to restore cracked or broken dentures to its almost perfect condition. We suggest repairs as soon as chipping or small breaks occur in the dentures or when addition of tooth/teeth to the denture is necessary due to wear and tear. Our denture repair services do not take more than a day. We fix your dentures while you wait. This is to minimize the days you will have to go on without wearing your dentures. Gluing the dentures when it breaks is strongly discouraged. Glues that can be found in the household are not ideal for the mouth and make the entire repair process hard to handle. If in case tooth falls off the denture, go to our laboratory and bring the extracted tooth with you and we will gladly fix the denture for you in no time. Dentures 4 You employs the best dental technicians and prosthetists to check your dentures for damage and then apply the necessary solution – whether relining or repairing. 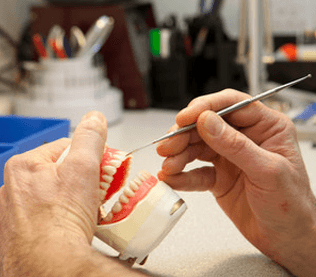 We take our craft seriously and we always make sure that all our clients go through careful assessment to see whether they are a candidate for denture repair or relining. If you feel that your dentures need a check-up, feel free to get in touch and we will be more than happy to lend a hand. Looking for a dental clinic on the Mornington Peninsula that can determine whether your dentures are in need of a Reline or Repairs? Contact us today on (03) 5981 2255 or book online peninsuladentalcare.com.au for a consult so that we can assess your suitability.